Welcome to Ullis and Rudolf! Our business idea is that animals can learn anything if you just give them the right motivation and give them opportunities for a fruitful collaboration! 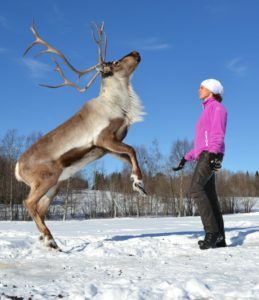 I and my clicker trained reindeer Rudolph, Frost and Vide are working on several fronts. Firstly, we give clicker classes and private lessons for dog owners who want to practice obedience, retrieving, not hunting reindeer, and much more, without fighting, screaming and pulls on the leash – we believe that dogs work best when they feel safe and have fun, just like any human. That also applies to reindeer. 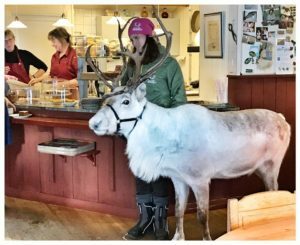 When the reindeer are not training dogs they offer their services as event reindeer, for those who are looking for that special something. 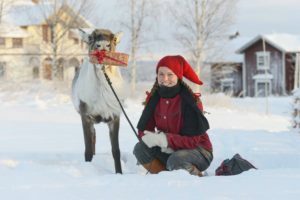 Let Rudolf cuddle with your trade show visitors, arrive to your wedding in a reindeer pulled carriage, or let your Christmas gifts be handed out by Rudolph and Santa. Both will follow you into your living room if you invite them! I’m 35 years old, and have a passion for training animals in all its forms! 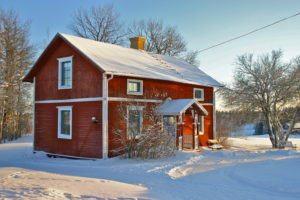 I live with my animals in Kluk, Åre. My motto is that nothing is impossible, and my goal is to continually develop as a trainer and tutor. I train all my animals continuously and hope to inspire others to bring out the enormous potential of their animals. All with positive reinforcement training, and on the animals’ terms. My labrador Zingo and I worked with clicker training for almost 12 years before he passed away, and Zingo showed that a happy and motivated dog can do almost anything! He is, for example, the only labrador who has two gold medals in the Swedish championships in dogsledding! He also brought you a beer from the fridge if you asked him. Check out the video here!